Next training is March 22nd, 2017 in downtown Boulder. do you want to make happen by the end of the next 6 months? Identify your main Guiding Principle to guide you & move through blocks! As you encounter the stumbling blocks that inevitably arise when you are taking bigger risks and upping your game, your Guiding Principle statement moves you through those blocks by returning you to your center, your ground and your power where all of your REAL answers and guidance reside. Come to our Guiding Principles Training to be in a room full of go-getting, passionately-driven people who care about making a difference in the world, and who've each identified a next big personal or business goal, project or action to bring to fruition by the end of the next six months. We'll do a fun three-step activity, and by the end of the evening, you will have identified your one most potent Guiding Principle statement for your 6-month goal/project. Here's the thing: Your Guiding Principle will likely surprise you. If we were to ask you, "What do you think your Guiding Principle is", you'd come up with something completely different. That's the beauty of the three steps - they bring you to your real Guiding Principle, which has wisdom not yet on your radar. Where: At Teem event space (2088 Broadway) in downtown Boulder. plus access to our 4 Centering Tools Video Series? Send me reminders & videos! 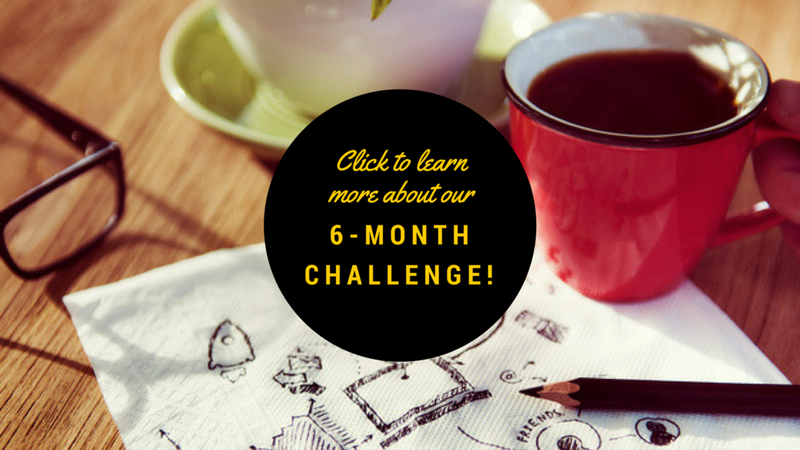 The 6-Month Challenge ensures that you bring your next six-month personal or business project, goal or action to fruition. As you take bigger risks and step out onto "bigger stages", new stumbling blocks inevitably arrive. Our Challenge programming helps you move through those blocks with it's action-based structure, balanced with its continual focus on returning to your center, ground and power where all your REAL answers and guidance lie. Principles Training, plus access to our 4 Centering Tools Video Series?